Timber Ridge Camping Cot XL is a folding, adjustable, and reclining fully padded heavy-duty bed with a steel frame and side storage elements. Can be used as a longer. This cot is currently available on Amazon. They usually have the best shipping conditions. The Timber Ridge Camping Cot XL is full of great features and this is a new item on the market. I would start with the letters XL in the name, so indeed this is an extra large cot with the bed size of 81 x 29 inches (206 x 74 cm). This is also a folding type so you fold it from two sides as you see in the picture below. This implies two things, one good and one not so good: a) the setup is very easy, no assembly, and b) it remains quite large in two dimensions when packed. The folded size is 32.84 x 29.92 x 8.27 inches (83.4 x 76 x 21 cm). As you see, at least it is rather thin in such a folded state. Massive padding in the head section. All legs are with adjustable height. Note that the feet are also pivoting so they adapt to any surface, and this feature is also useful when you fold the cot, you can make them flat. This is a recliner-type, which means that you can raise the back and keep it at any angle. So the bed can be fully flat and you can use it as a cot, but it can also be used as a longer or a camping chair with footrest. You have two knobs on the sides to regulate the back angle. Capacity-wise, this cot supports up to 350 lb (159 kg), and this should be fine for most of the users. But if you need something stronger please check my list of cots for heavy people. Size-wise, this is a remarkable cot, you have seen its dimensions mentioned above. With such a size and padding, this is a great item even if you are a very tall person. But if this length is not enough, check these extra long cots for tall people. Weight-wise, it is reasonably heavy for such a type. You will be able to compare its 25.6 lb (11.6 kg) to some other cots built in the same style, there is a comparison table below. They describe it as perfect for camping, fishing, sporting events, barbecues, and backyard use, and they are right. I would add it is also great as a spare bed for sudden guests and grandchildren when they visit you. The minimum height is around 13 inches (33 cm) so if you use this cot in a tent, you can store lots of stuff underneath it. But this might be too low for elderly users. If so, please check the Chinook Padded Cot which is 20 inches (51 cm) tall. But as I said, this is the minimum height, its legs are extendable. This cot should not be mixed with yet another similar padded cot from this brand, the Juniper Cot described in my another text. The big difference is that here you have 6 legs as compared to 4 in the mentioned cot, see the picture. So this is a more stable construction. Here the cot is almost flat, observe the extended legs on the left. The frame is steel and the fabric is polyester. Obviously, there is some open-cell foam inside, hard to know what type unless you destroy the fabric to have a look. But this is enough padding for comfort and for insulation in at least 2 seasons. In a much cooler environment, you might want to add some extra insulation. The feet are great, the weight is distributed to six of them, they are large and the cot will not sink in the ground. You can use it also in a floored large family camping tent. 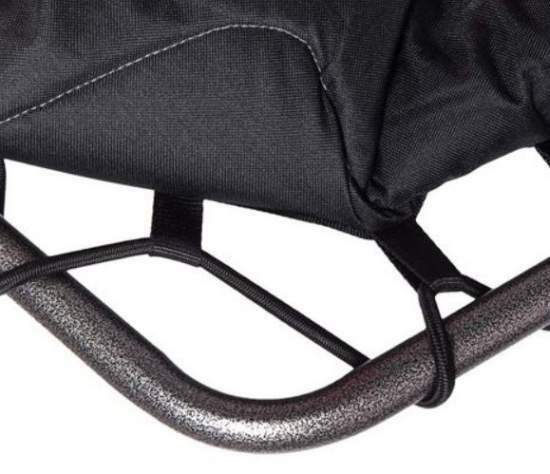 The bed is attached to the frame with a cord, see the picture. This is similar to what you have in its competitors shown below. The bed attachment to the frame. Weight: 25.6 lb (11.6 kg). Dimensions: 81 x 29 in (206 x 74 cm). 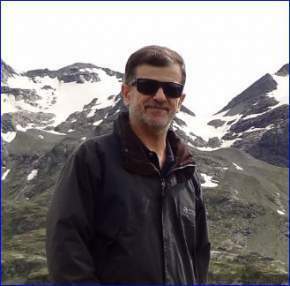 Height: 13 in (33 cm). Folded size: 32.84 x 29.92 x 8.27 in (83.4 x 76 x 21 cm). Warranty: 1-year warranty against any defective workmanship and material. I mentioned above the comparison table, so here it is, this cot side by side with two top-notch items built in a similar style. As you see, its capacity is lower and it is narrower. But it is far more affordable and it has some features that are missing in the other two cots. Please follow the links for more. So this Timber Ridge Camping Cot XL is indeed with some great features that set it apart from both the standard camping cots and also from its closest competitors that are built in the same style as padded and adjustable cots. It is also far more affordable than the cots shown in the table above. 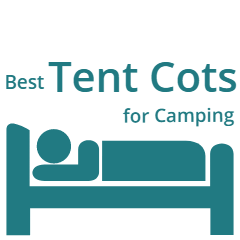 This cot is very long and reasonably wide, but if you still need something wider, please check these extra wide cots for camping. 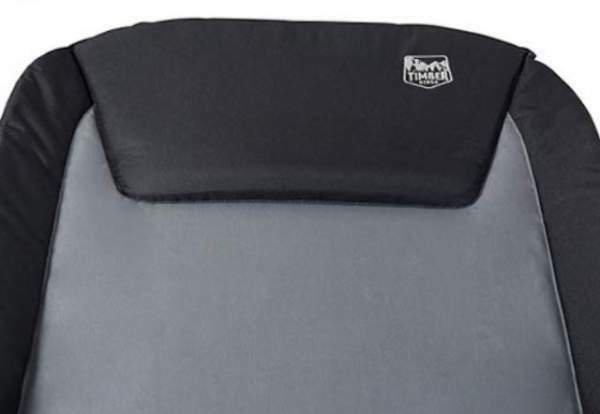 I have added it to my list of best cots for car camping and also to best padded cots for camping. Note that this is not a sponsored text, I am not related to or paid by the manufacturer. 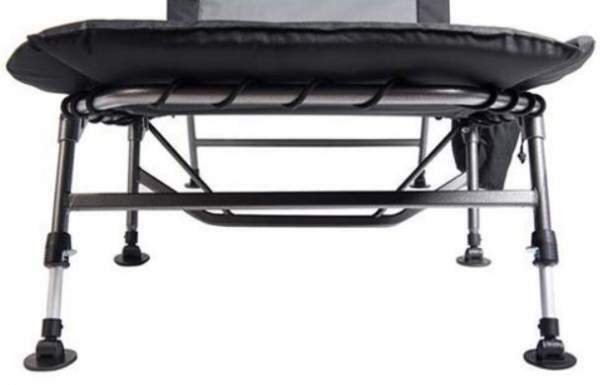 Do you have any experience with this cot? If so please share it here, there is a comment box below.